Our newly patented In Bin Glass Crusher is compact, simple and convenient to use as well as being environmentally friendly. This cost effective machine smashes your problems relating to glass waste management – from noise pollution, volume reduction to cutting collection costs. 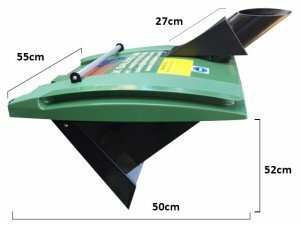 This product incorporates a 240 litre waste bin lid, which mounts onto any standard 240 litre bin. Glass bottles are dropped into the shute, where it is instantly crushed and falls straight into your bin ready for collection. Once the glass is crushed, the unit can be removed and placed onto the next bin. As an alternative option, this product can also be wall mounted, thereby allowing multiple bins to be offered to the crusher one at a time. Other options consist of crushing into a small plastic bin. This product is a revelation for hospitality venues such as restaurants,bars, pubs, hotels to name a few. Why is glass waste collection so expensive? Empty glass bottles consist of mainly of air, therefore hospitality venues are predominantly paying to have air removed from their premises, rather than actual glass. Empty bottles take up space, which means that sites either have large number of bins collected weekly, or if space is limited, fewer bins are collected more frequently; either way it is EXPENSIVE. Disposing of empty glass bottles is inconvenient, costly and inefficient! By smashing these bottles into cullet glass saves money and much more! Until now, only the largest venues have been able to justify investing into bottle smashers. Even for these venues the bins have to be filled with cullet glass in order for them to yield a return on their investment. These bins once full can weigh up to 200kg and therefore difficult to manoeuvre and many collectors refuse to handle them. The In Bin Glass Crusher changes everything! it is ideally suited for those venues that produce up to 240 litre bins of glass waste, per week. 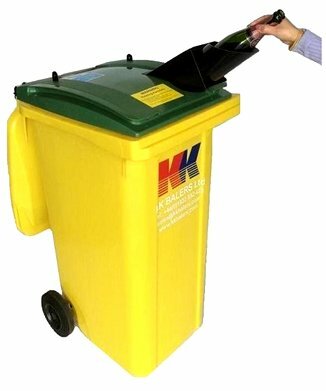 The In Bin Glass Crusher conforms to all health and safety regulations and can be purchased or hired. Please contact us for further details.